The Wait For Registry action allows you to wait until a change occurs in the Windows registry. For an overview of "Wait For..." events, including specifics of the Wait Options, see this topic. Specify a root key value, a subkey, and (optionally) a key value name. Leave the Value field blank to choose the (Default) value for the key. The action will pause until the specified value (or key) exists. "Key value to no longer exist"
The action will pause until the specified value (or key) no longer exists. A blank string value does not qualify as non-existence. The action will pause until the key value has changed from the value read when the action begins waiting. The action will pause until the key value until the key value matches the specified "Wait Value". 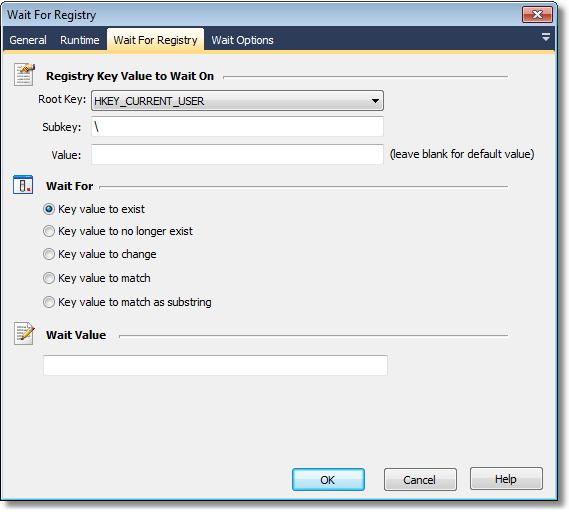 "Key value to match as substring"
The action will pause until the key value contains the specified "Wait Value" as a substring. Specify the value to wait for, in the case of the last two Wait For options. String values are treated literally. DWORD values are treated as their integer values. Binary data blocks are extracted as byte strings. No other data types are supported.